I love when I can find complete sets in the wild, because then I can do some in depth reviews! This week, I’ll be looking at the recent Forza series release from Hot Wheels. Kicking things off is the first of five: the Morris Mini. Nothing really new or exciting to see here. We’ve all seen this Mini casting over and over again, except this time its been given the premium treatment. Correction: The body DOES pop off the chassis! Its the newer tooling too; the body doesn’t pop off the chassis. I didn’t mean for any of that to sound negative though, this Mini looks mean! 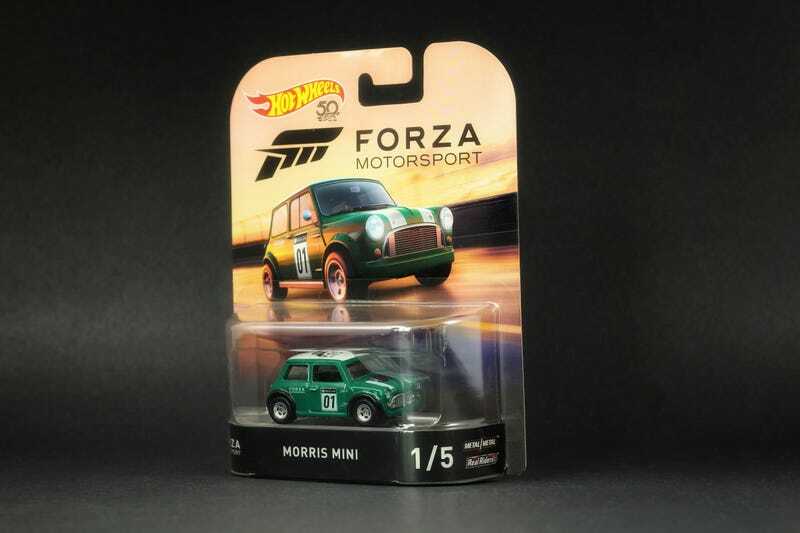 Draped in British Racing Green with a “GB” sticker on the back, the Forza Mini looks exactly like something I’d create in the game. Headlights, tailights, black fender flares, and a white roof round off the paint job. The five-spoke Real-Riders are a perfect match as well. While it isn’t my favorite from the series, its definitely a solid stand-out in this series! Stay tuned tomorrow when I look at the AMC Rebel Machine.